Have you ever been caught in car trouble just as you are rushing out for work in the morning? Car trouble doesn’t necessarily fall under engine failure or lack of fuel. During the rush, there are many people who can reveal that their car keys simply stopped working. Thanks to the evolution of the locksmith niche, there are now myriads of automotive locksmiths who can help you out of car trouble. Whether you are locked out of your car or you have a damaged ignition lock, a professional auto locksmith will always come to your rescue. Highlighted in this article are a few situations that you should know when you’ll need the help of an expert automotive locksmith. Have you ever locked yourself out of your car or left your keys locked on the dashboard? If you have been in these situations before, it’s quite tempting to break the glass to get the keys or get a clothes hanger to lift the door lock. However, breaking the glass will certainly cost you lots of money to repair the damage. On the other hand, trying to lift the car lock with a clothes hanger might take forever. This is true especially if you’re not an expert at that. Even worse, people might start mistaking you for a car thief. In order to avoid these situations, calling an automotive locksmith service can be quite beneficial. There are plenty of professional auto locksmiths out there who offer emergency services. They simply have the necessary tools to get you back in your car and on the road in the shortest time possible. Even better, you don’ have to pay huge amount of money trying to repair a broken window. There are various situations when you might need new keys for your car. If you recently lost or misplaced your keys or if they were stolen along with your possessions, key cutting services will definitely come in handy. There is no way you can drive your car without your keys unless you can hotwire it. However, this brings lots of trouble your way. 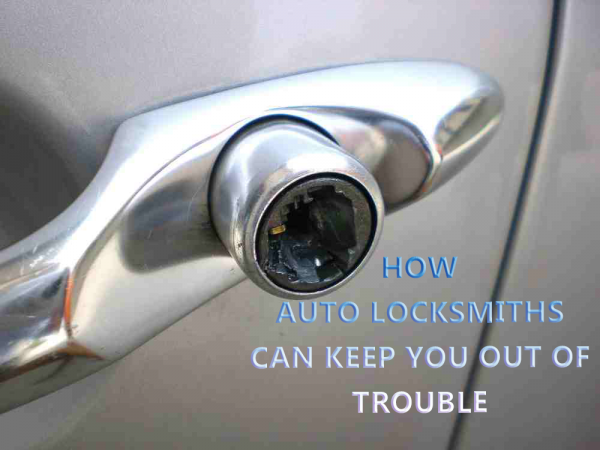 Therefore, contacting an automotive locksmith in your area is highly essential. These car locksmiths have advanced their skills and services to offer emergency key cutting services. This means you don’t have to wait for days to get your keys. You can rather get them on the spot without any delays. In some situations, your car key will not simply turn the ignition on. Also, there are chances that your key might get stuck on the ignition or car door leaving you in huge trouble. If there is no way to extract the key without damaging the ignition, contacting an automotive locksmith is the best idea. With the help of auto locksmith, it’s quite easy to get a completely new set of keys for your car ignition or car door without delay. Definitely, this might take longer than expected. So, you should be ready to wait for a few hours until the new ignition is installed or the door keyhole is repaired. However, once everything is in place, the new keys will be cut within the shortest time possible. Have you ever had the misfortune of breaking your key when turning the ignition or car door? Well, this is quite a common problem for most car owners. In the rush to get into their cars, most riders eventually end up turning the key the wrong way and breaking it off in the keyhole. Well, there are no better ways of extracting the broken key than calling an auto locksmith immediately. The extraction process requires finesse and extreme care to guarantee that the ignition or door keyhole is not damaged. Otherwise, you would have to replace everything again. Next, the auto locksmith will cut new keys for you without any hassles. You should definitely rely on the services of an expert automotive locksmith to do it right for you. There are many instances when your car remote might have malfunctioned. In such cases, you will find that doing the simple tasks you are used to can be quite difficult. However, auto locksmiths always come in handy during these situations. They can reprogram the remote or identify and repair the problem accordingly to make sure it will function again as it should. Over the years your car has been in use. You might start to notice that turning the car door or the ignition has become difficult. This is definitely because of the wear and tear process. This time, getting your engine to start usually takes a few turns at the engine. On the other hand, opening your car door takes lots of effort. It’s just prudent to replace your car keys and ignition after a few years or as soon as they become worn out. It is a rather simple process and contacting an automotive locksmith is the best way to do it right. By now, you are already familiar of the different situations when you need the help of an expert auto locksmith. So, the next time you are facing any of these mentioned car key issues, contact an auto locksmith right away. Certainly, your issue will be sorted out within the shortest time possible!